In Prime Minister Justin Trudeau's fourth town hall of the year in Saint-Hyacinthe, Que. he was forced to defend Canada's immigration system, his pledge to compensate dairy farmers and his plan to fight climate change with a national price on carbon. 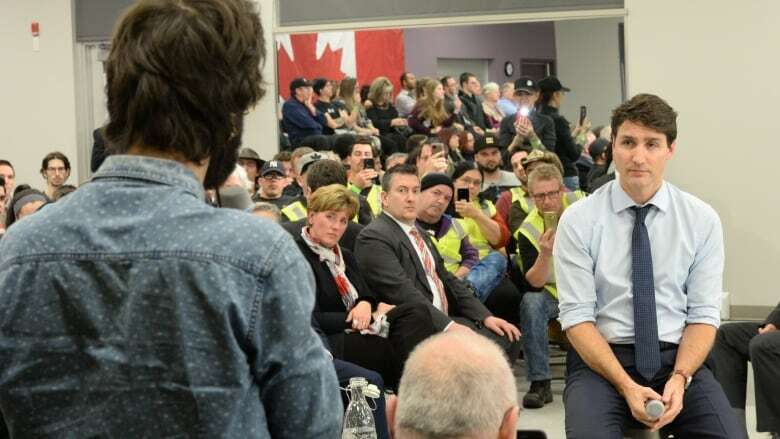 Prime Minister Justin Trudeau was forced to defend Canada's immigration system, his pledge to compensate dairy farmers and his plan to fight climate change with a national price on carbon, during his fourth town hall of the year in Saint-Hyacinthe, Que., on Friday. Early on, a member of the audience asked Trudeau about his plans to fight climate change and how his government can pledge to do that — by putting a price on carbon — while investing in the Trans Mountain pipeline, a project that would emit more carbon into the atmosphere. The prime minister replied saying pipelines were safer than moving oil by rail, using the example of the 2013 Lac-Mégantic, Que., rail disaster where a train laden with crude oil derailed causing an explosion that killed dozens. He also reminded the audience of his often used line that the pipeline represents growing the economy while the price on carbon represents taking care of the environment. Trudeau said those tasks should be done together. Several in attendance asked Trudeau about immigration, and the challenges of integrating Muslim immigrants, including one questioner who asked what the prime minister is going to do to prevent Sharia law from being imposed in Canada. "For each wave of immigrants who coming here looking to find a better world and make a better life for their children, there are people who have fears about these differences," Trudeau said. "But I can tell you sir that the law in Canada, even in Ontario, is not the Sharia law and will not be Sharia law." Trudeau was also confronted by a dairy farmer who was visibly upset with the concessions the federal government has made on their behalf in striking trade deals with the U.S., the EU and Pacific rim countries. The farmer was also concerned that any compensation offered to dairy farmers as a result of those trade deals would not go to the farmers who need them most. The prime minister promised that dairy farmers would not be asked for any further concessions when the federal government reaches out to strike international trade deals. "I will make sure that there will be the proper compensation, not determined by me, the federal government, but determined by dairy producers such as yourself," Trudeau said in French. During his first three town halls Trudeau faced some tough questions and some angry members of the public in Kamloops, B.C., Regina, Sask. and St. Catharines, Ont. During an event at Brock University, Trudeau was asked about the situation in northern British Columbia, where the RCMP recently broke a pipeline blockade by the Wet'suwet'en people. "You have allowed forcible removal of Wet'suwet'en First Nation people from their land," one audience member said to loud applause. "Would you please explain in relatable, truthful language, why you are allowing this to occur?" Trudeau responded by saying Canada's government has for generations failed to live up to the spirit and intent of the original treaties, with residential schools and a skewed legal system among the results. One of the most contentious issues in Kamloops proved to be the Trans Mountain pipeline expansion, with some in attendance adamantly supporting the pipeline because of the jobs it could create, and others opposing it for environmental reasons. Arnie Jack of the Shuswap Nation in the B.C. Interior confronted Trudeau about RCMP actions in northern B.C., saying that without the consent of the people, the prime minister would have to "go through us first." The day before the Kamloops town hall RCMP officers entered the first of two blockades in northern B.C to enforce a court injunction granting workers with the Coastal GasLink natural gas pipeline project access to a road and bridge. The officers arrested 14 people. Later, Wet'suwet'en hereditary chiefs and RCMP reached a tentative agreement allowing workers access to the pipeline — but not before Trudeau had to face some tough questions about the standoff. Trudeau responded to Jack by saying there is a broad range of Indigenous perspectives on the project. "We are going to have to work together," he said, over heckling from the crowd. "I understand your frustration." After Kamloops, the prime minister moved his roadshow to the University of Regina. Courtland Klein, 38, who works at the Evraz steel fabrication plant in Regina, was critical of the lack of progress on Trans Mountain. "You've got yourself in a hell of a predicament," he told the prime minister. "You pissed off the Greens, you pissed off your base, you pissed off us that don't like you and the pipeline still isn't in the ground. "You can legalize marijuana, but we can't twin a pipeline, an existing pipeline to the coast." The Regina crowd grew more animated when Trudeau took a question from a man who said Islam and Christianity don't mix and demanded to know what the prime minister was planning to do about the tens of thousands of people who had crossed the border illegally in search of asylum in the last year. Trudeau said there is no open border and defended Canada's immigration system as effective at both allowing people into the country and integrating them into society. He pointed to the success of Syrian refugees as an example.